I'm sure you've all heard by now that the Seattle Post-Intelligencer has ceased to exist as an ink and paper newspaper. I'm sure you've also heard about the Washington Post cutting its business section six days out of the week. 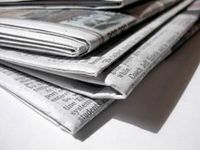 Everyone seems to agree that this is just the beginning of the cuts and closings that will affect the newspaper industry in the coming months and years. Frankly, this trend scares me to death. Yes, there will be national newspapers, TV news, and online news, but what we really need as a society are those local newsrooms. I have a master's degree in journalism. I went to journalism school largely because I believe in the power and the importance of the press as the fourth estate. If we lose local newsrooms, we lose the watchdog power of the media. I think the most disheartening part of seeing the physical Seattle P-I close is that only 20 of its reporters went to the website. Not only is that a lot of lost jobs, but that represents a lot of important news contacts lost. That represents a lot of carefully cultivated sources gone. That represents a lot of shady, lazy, or dishonest politicians, corporations, and agencies that won't be watched as carefully as they used to be. And the thing is, if it can happen in information-savvy Seattle to a well-established newspaper, it can happen anywhere. San Francisco could be next. And when those papers in the smaller markets start to fall, there is not going to be anyone covering small-town politics at all. And frankly, even in Seattle, a tiny web staff isn't going to be able to cover the city the way it used to. Journalism and journalists are much maligned. But I truly believe that the press keeps the powers-that-be in line. It scares the hell out of me that bit by bit we are starting to lose the eyes and ears that investigate and report on those powers. It makes me nervous about the future. As citizens, we need that extra line of defense. I don't know what the answer is, but I do know that in order to be a free and well-informed society, we need numerous and well-staffed newsrooms all over this country. Original DC Metro Moms post. Jean also writes at Stimeyland.